The holiday season is a special time to spend with loved ones, creating joyous memories and celebrations. While we busily prepare for special events, put up elaborate holiday decorations and make mad dashes searching for the perfect gifts for our friends and family, the magic of the holidays can also come with stressful chaos. With all of the busyness going on, it is important to keep kindness in our hearts. It keeps us more mentally sane and positive, especially during such a busy time. This is the perfect time to spread kindness to others both within the family and beyond our families. One family tradition that we introduced is the Kindness Elves. 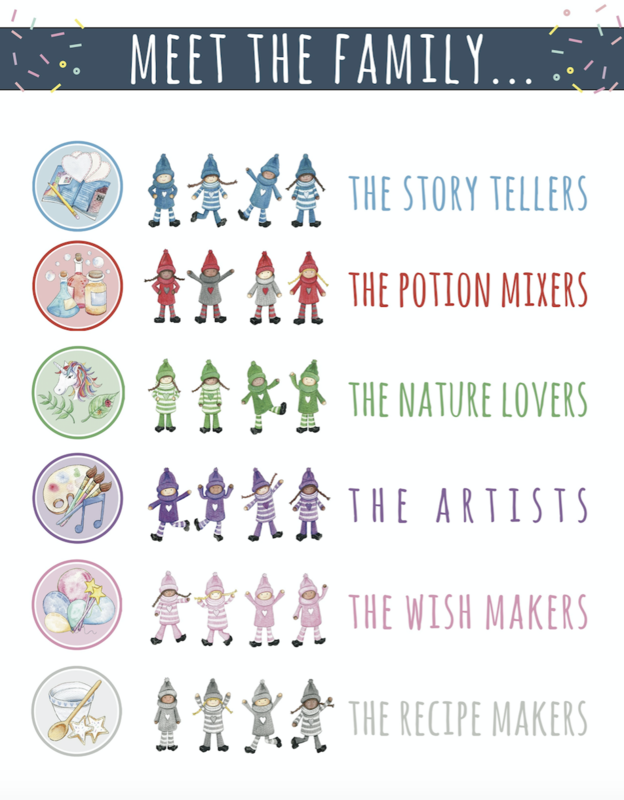 They are adorable elves who inspire children to be kind towards others. Unlike the alternative Elf on the Shelf, who is sent to homes to monitor children’s behavior to report back to Santa, the Kindness Elves have a more positive role in spreading kindness and joy as their only mission. Good deeds can be big or small, grand or simple. The main focus is sharing happiness with others. For many of us with jam-packed schedules, it may feel daunting to add thinking about elves to our day, especially during this time of year. I mean, many parents are thinking, “I can barely get enough time for myself or rest,” it is understandable that having to set up elves in the house may seem like an extra task to think about. 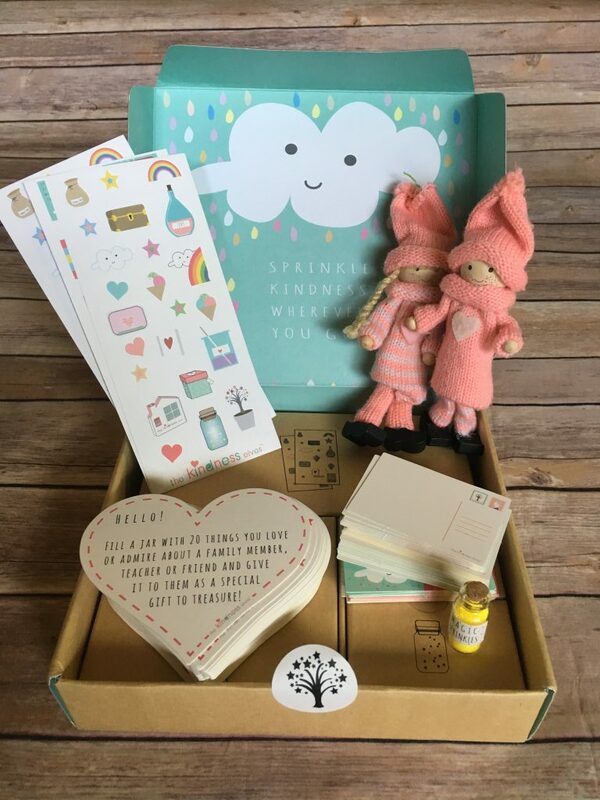 The beauty of the Kindness Elves as a tradition is the ease of use, the flexibility, and the ready-to-go notes and accessories, and above all, the beautiful lesson it teaches children. There is minimal set-up, preparation, or clean-up. 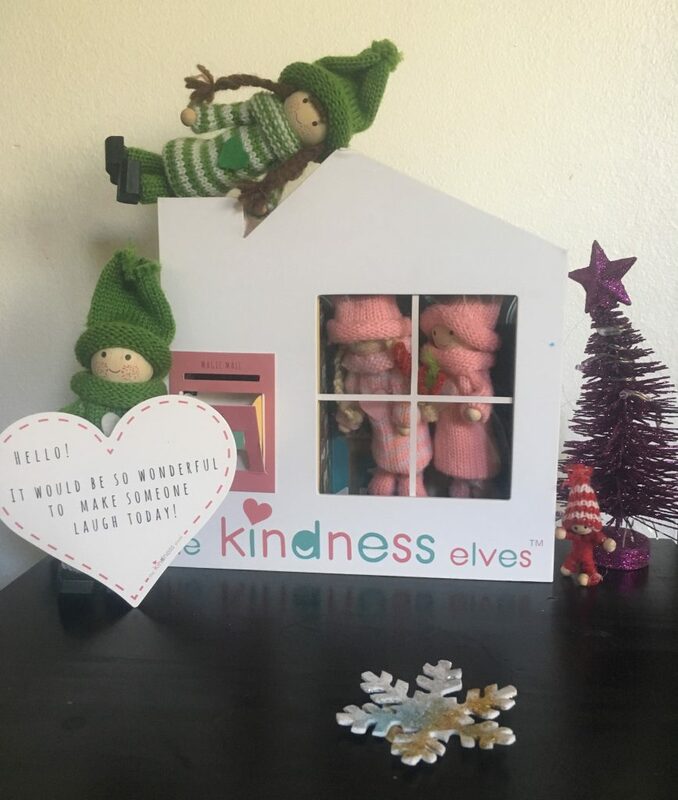 The Kindness Elves come with their own cozy home equipped with a mailbox to exchange notes with children. There are 14 different color options and combinations, each family group has their own personality and interests too! Once out of the box, the Kindness Elves are ready to go to inspire good deeds. Do what works for your family. Remember the key point here is to encourage kindness. 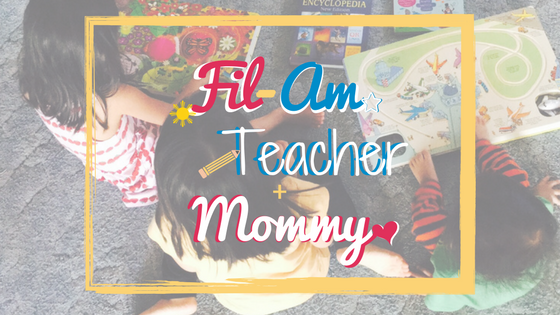 It is not necessary to make elaborate crafts or have the Kindness Elves do activities that may feel like too much work or clean-up for your family. You can keep it as simple or as detailed as you would like. Think of the needs of neighbors, family, friends, or community members during this time of year. What are some simple ways to bring holiday cheer to them? What are some ways your family can show gratitude to others? Have the Kindness Elves make suggestions such as helping a neighbor with their holiday decorations outside or delivering cookies to the firefighters, or calling family who lives far away to say hi and greet happy holidays. The ideas are endless! Use the Accessories Pack which has great tools and notes that are ready to go. It includes pre-written notes with acts of kindness, blank ones for your own ideas, colorful postcards for the elves to write to the children, stickers, and a bottle of Magic Sprinkles. It also has a Little Book of Big Kindnesses as a memory keepsake to store the notes and kind memories. It’s a wonderful family tradition to share and reflect on for years to come. The Kindness Elves can leave the pre-made or your own personalized notes as frequently as it fits your family’s schedule. 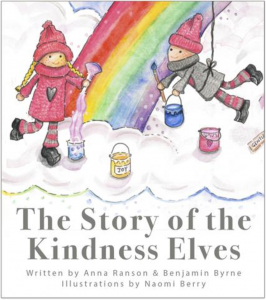 If your child loves to read, the Kindness Elves have a beautifully illustrated hardcover storybook. It would make the perfect gift to accompany or introduce the tradition of the Kindness Elves. Enjoy the time together. It is so amazing to see how proud the children are when they know they did a good thing for someone else. Doing acts of kindness with your child or children results in a very rewarding feeling. Ready to spread kindness as a holiday tradition with your child? 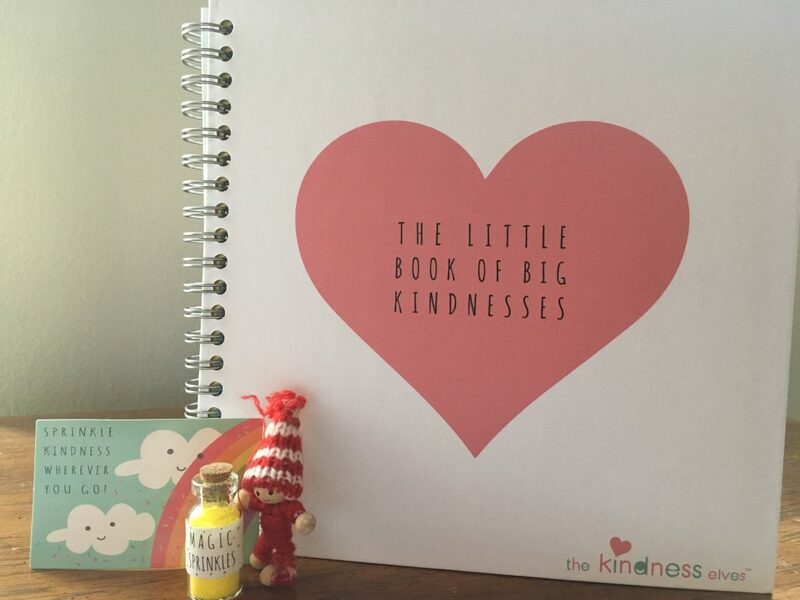 Head over here to the Kindness Elves shop.